Note: This is a copy of an article that I had published in Backwoodsman Magazine a couple of years ago. I’m posting it here because I think it fits in with my last couple of blogs on survival archery equipment. Because of its length, I am making two posts out of it. 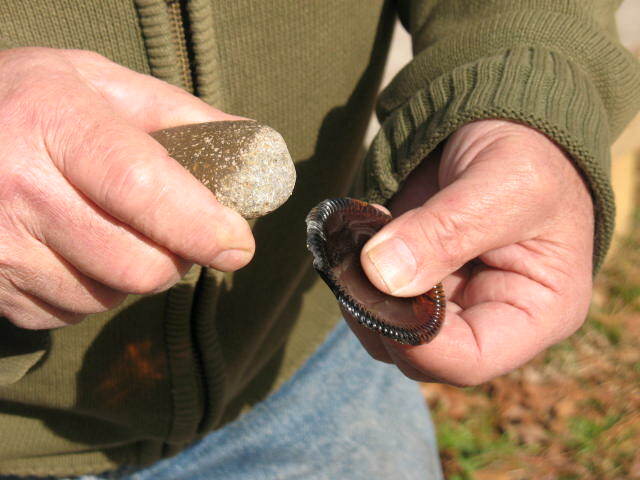 I have always wanted to learn how to flint knap but I have been plagued by a problem that many aspiring flint knappers face; there is no flint or obsidian where I live. For years I looked for flint whenever I was on vacation, always with very limited success. I bought a chunk of obsidian at a garage sale, and was able to work with it for a while, but it played out long before I learned much about knapping. The problem with being a beginner is that, at least in my case, I ended up with more waste than I did points. When you’re producing more junk than good stuff, it’s hard to justify paying money for a piece of rock. 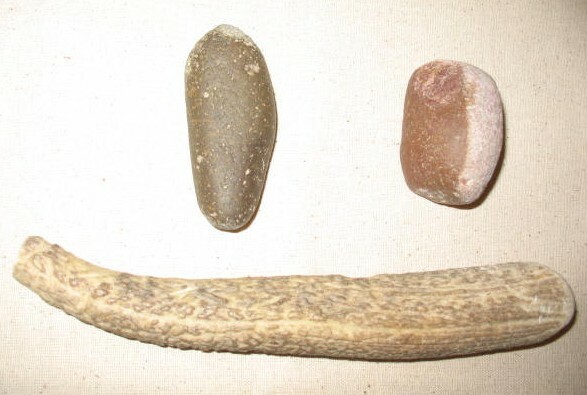 Pictured below: Flint and obsidian arrow points. 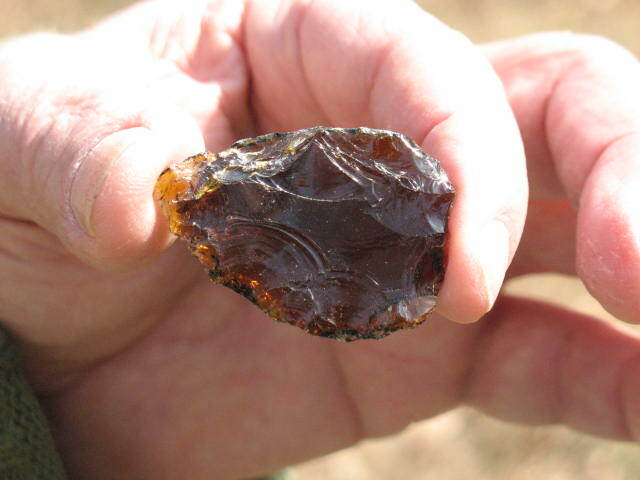 Finally, an acquaintance of mine, who is a first class knapper, turned me on to an inexpensive and virtually limitless supply of locally available knapping material. He told me to do my practicing on old glass bottles. When you think about it, it makes sense. After all, obsidian is nothing but a natural glass made by volcanoes; so instead of buying expensive natural glass, why not practice on cheap man-made glass. What a revelation! I dug through the trash for an old beer bottle and started right away. And you know what, my first glass point turned out pretty decent. Since then I’ve been hooked on knapping old glass bottles. I now refer to beer bottles as my East Texas Obsidian, but I didn’t stop with beer bottles. I started keeping my eyes open at garage sales and thrift stores, and buying colored bottles. 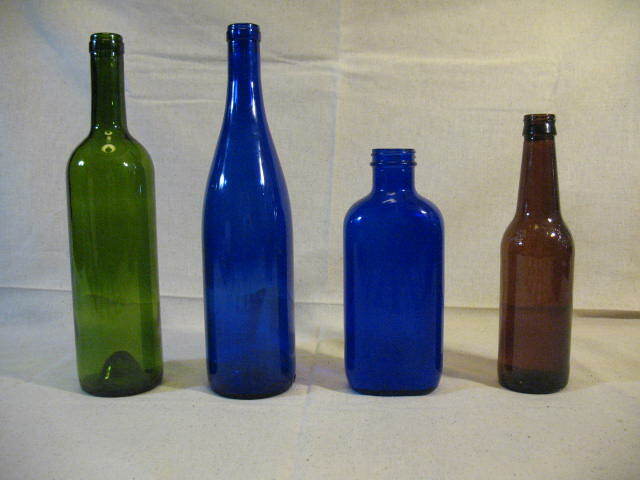 I’ve turned out some really nice green and blue points using old bottles. Pictured below: Colored bottles. You learn pretty fast that some bottles are better than others, and some parts of the bottle will make better points. When it comes to beer bottles, I like to use what they call “bar bottles.” These are the bottles that can be refilled, and the glass in them is a little thicker than the throw-away type bottles. One problem with bottles is that they are curved; and the smaller the bottle, the tighter the curve. This can be a problem if you’re making a very large point. I’ve found that the best part of the bottle to use, especially on beer bottles, is the bottom. The glass on the bottom of the bottle is thicker and the curve of the glass is not as pronounced as the glass on the sides of the bottle. Another thing that I’ve learned is that the way the glass breaks is affected by the temperature. If the glass is cold it is more unpredictable. I like to set a bottle by my wood stove or by a campfire and warm it up a little before I break into it. You don’t want to get it so hot that you can’t hold it; just warm it up. 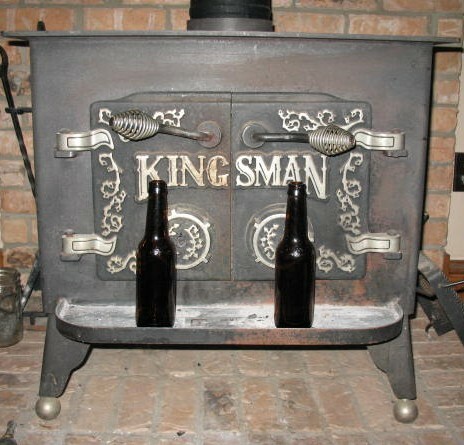 Pictured below: Warming bottles by my wood stove. When you’ve selected a good bottle and warmed it up, it’s time to start breaking glass. Before you bust into the bottle you need to take some safety precautions. You should always wear safety glasses, not just regular glasses, but real safety glasses. Those little shards of glass fly like shrapnel, and an eyeball won’t slow them down much, so wear your safety glasses. If you do a lot of knapping it’s probably a good idea to wear a dust mask over your mouth and nose. Every time you knock a flake off, you’re sending loads of nearly microscopic glass particles into the air. Breathing this glass dust into your lungs can cause really bad things to happen, just like breathing asbestos dust. So, now that you’re all geared up, let’s break some glass. 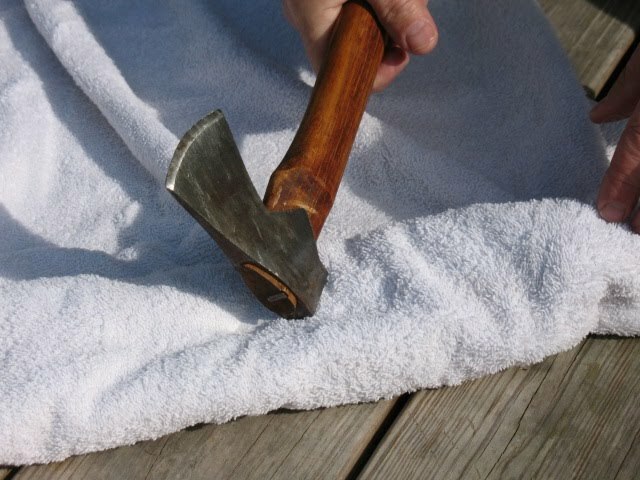 Take your bottle and wrap it up in an old towel, lay it on a hard surface, and gently wack the side of the bottle with a hammer. 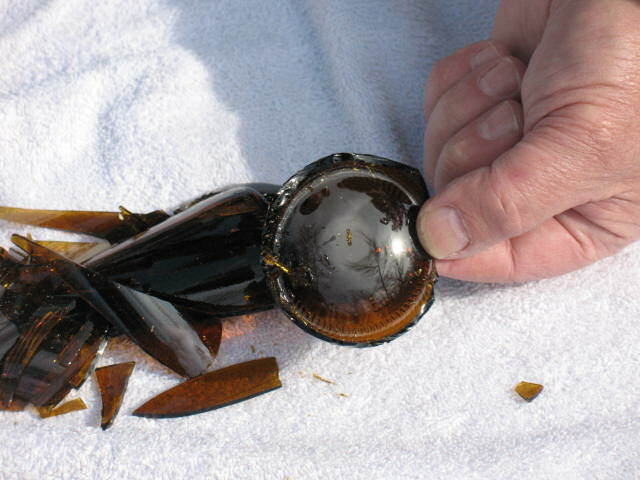 Try not to smash the bottle, or you’ll end up with pieces that are too small to use. I usually hit the upper shoulder of the bottle because I’m trying to keep the bottom in one piece. Pictured below: Breaking a bottle. After you hear that satisfying crunch, unwrap the towel and see what you’ve got. With any luck the bottom will still be in one piece with a few jagged points of glass sticking up. If you weren’t so lucky, no big deal, it’s just an old bottle. Grab another one and try again. Pictured below: Bottom of bottle. 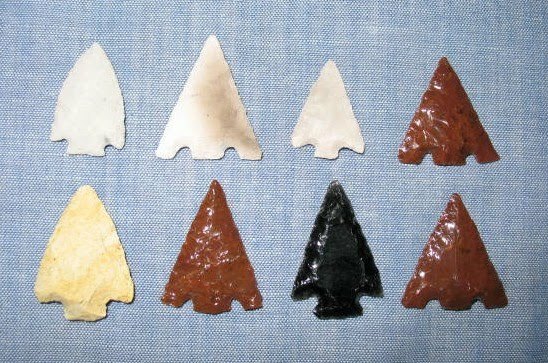 This is what you are looking for to make your arrowhead out of. Now it’s time to do a little percussion flaking. 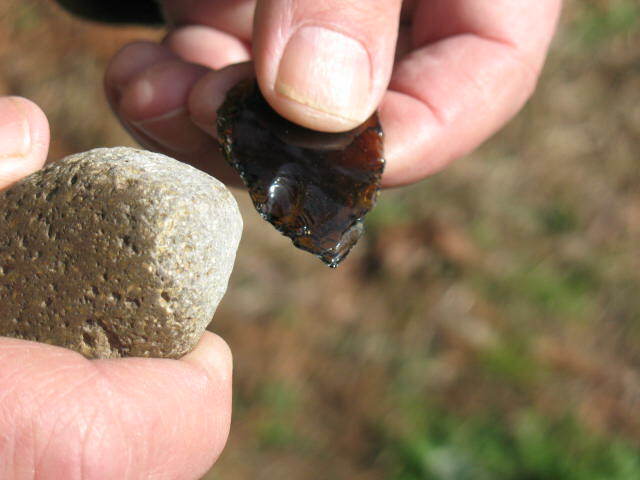 Percussion flaking is where you use a rock or an antler billet to knock flakes off of the edge of your glass. Percussion flaking is not going to be pretty; it’s just how you’re going to rough out the shape of your point. Pictured below: Percussion flaking tools. You’ll want to start by knocking off those jagged points where some of the glass from the sides of the bottle is still attached to the bottom of the bottle. Be careful and try not to cut yourself. Remember, glass is sharp. Pictured below: Removing jagged points from bottle bottom. When you have the side glass removed, it is time to start knocking the bottom into shape. Just strike glancing blows to the edge of the glass. Don’t try to take off too much at one time. After you have knocked a series of flakes from one side of the glass, turn the glass over and knock flakes from the other side. 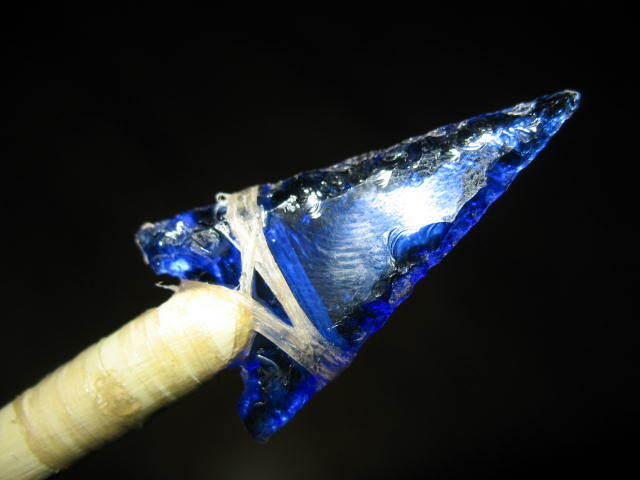 Work your glass down into a triangle that is somewhat bigger than you want your finished point to be. 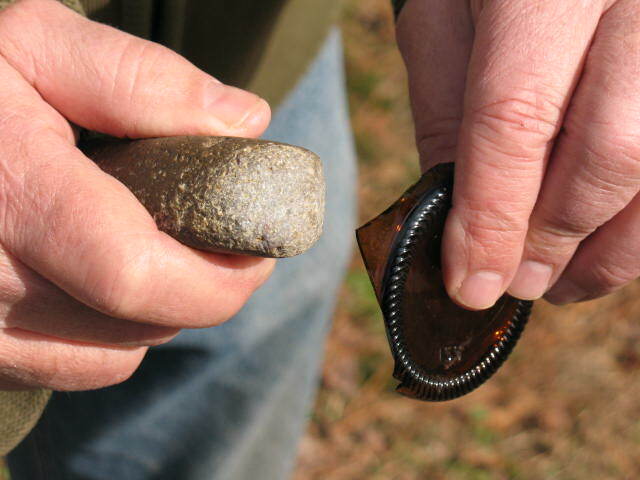 Picture below: Percussion flaking the bottle bottom into a rough shape from which you can flake the finished point. Next blog will be about how to pressure flake the rough point into its finished shape.